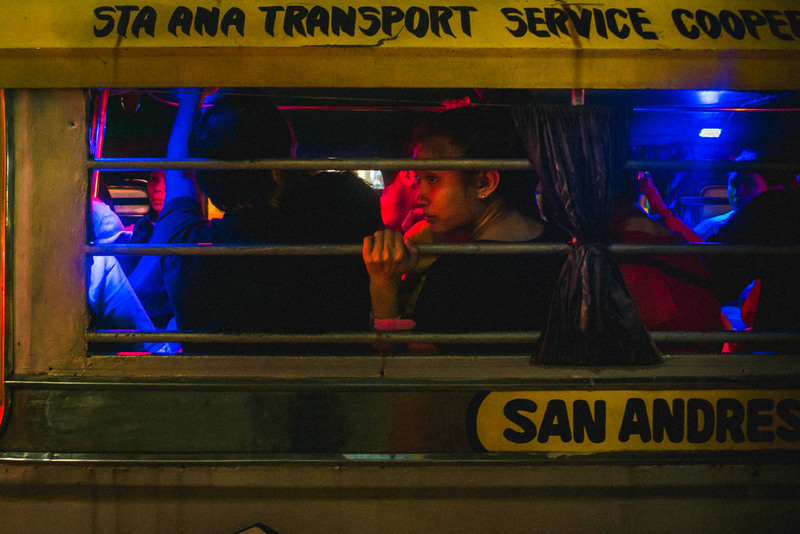 A commuter looking out the window of a jeepney bound for San Andres, Manila. Taken last December 17, 2016 near Robinson’s Place Manila in Ermita. I’ll be honest with you. These days I’d mostly take an Uber or GrabCar when getting around the Metro. Only because most of where I need to go would take longer if I took a jeep. But that said, I still love taking photos of these old beasts and the people they ferry from location to location. It can get expensive taking Uber every single day but a lot of times it is more practical than taking three different jeepneys just to get to where you need to go. I’d ride a jeep here around Malate and Ermita when I only need to get around for a few blocks. Maybe soon I’d be brave enough to take my camera out while inside crowded jeepneys so I could take candid photos from inside. Filed under Street Photography. Tagged as 35mm, Buhay Jeepney, Ermita, Manila, Manila by night, Sony A7SII, Street Photography, Streets of Manila, Summicron.